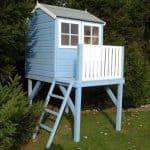 This neat looking tower playhouse follows the traditional design that we often see, and which young children love, but being slightly larger than most it offers even more opportunities for the children or grandchildren in your life to indulge themselves and let their imaginations run free. 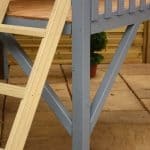 Even though it has lots of space to explore on its two levels, it still has a relatively small footprint so you won’t have to worry about finding space for it in your garden. Another potential worry, of course, is the overall safety of the playhouse but this is another one you can leave behind thanks to the reassurance of its EN71 mark. This means it meets the latest and highest safety specifications, and one example of this attention to safety is shown in the two fixed windows. They feature styrene glazing, which is very strong, resilient and shatterproof. Strength is a mark of this playhouse as a whole, as shown by the use of tough tongue and groove cladding for the walls, a mark of quality we were glad to see. Both this and the mineral felt covered apex roof help to stop rain from getting to the interior, so occupants and toys will remain dry. 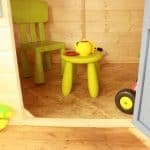 Although we have reviewed larger playhouses, this is still one of the biggest, most accommodating ones that we’ve seen. That makes it a great place for your children or grandchildren to share time with their friends. 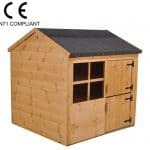 The raised playhouse has a peak height of 2.66m and an eaves height of 2.15m. It also has a base width of 2.44m and a base depth of 2.16m. 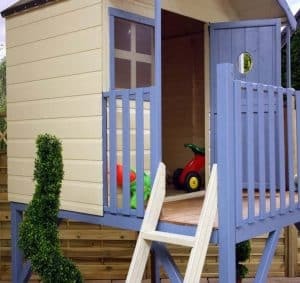 One of the things we liked most about this playhouse, and we’re sure that children will appreciate it too, is that it has two levels thanks to its raised platform. 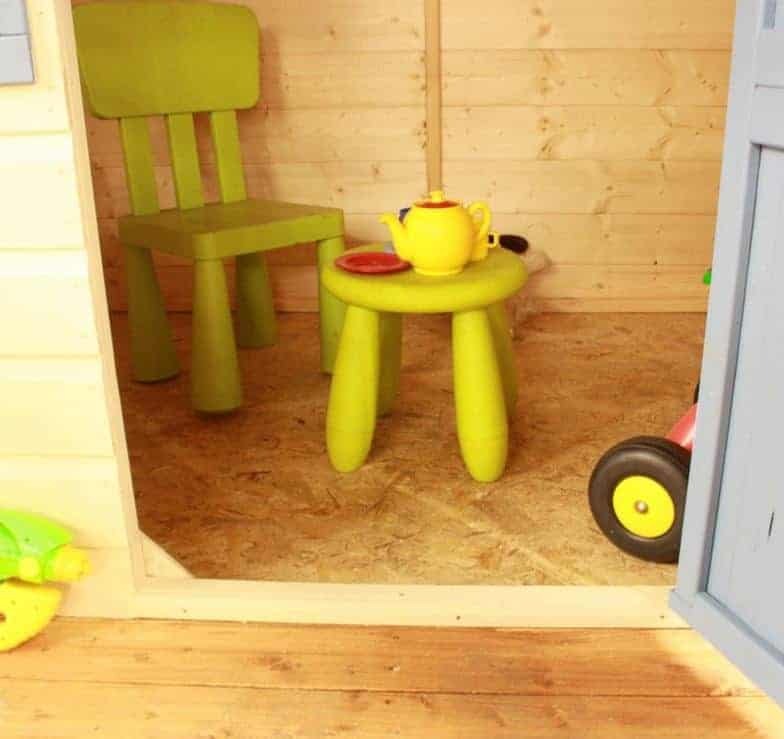 The attractive playhouse itself, accessible via a strong and sturdy ladder, will get most attention and it’s an ideal location for your young ones to play with their favourite toys, or have a tea party with their teddies or dolls. There’s also a verandah area, with a wooden balcony at the end. Underneath the playhouse is an open area with four supporting timbers on each corner. Children will love to spend time here as well in the shade on a sunny day, and we can imagine it being turned into a den. The cladding may not excite children, but it did excite us as we were pleased to see that 12mm thick tongue and groove cladding had been used for the walls, along with a standard sized 28 X 28mm frame. This not only provides excellent protection against rain, as does the apex roof which simply channels precipitation away, it also creates a stable and reliable structure that can stand up to all the UK weather can bring. The roof and floor were made not of tongue and groove but of solid hardwood material. This is a cheaper option, but it’s one that we’re used to seeing on playhouses. It’s thickness of 10mm is also one that we often find. The dip treatment used to add wood preserver to the timber is a short term solution, and this means that the owner will have to apply their own coats every year. Whilst we would have preferred to see a longer lasting pressure treatment used, we were still impressed by the warranty provided by the manufacturer. Whilst parts come with a statutory one year warranty, the timber itself is guaranteed rot free for ten years as long as the treatment schedule is adhered to. 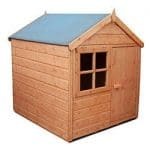 We feel this gives added value and peace of mind for what is, after all, not the cheapest of playhouses. The door features brass style hinges and has dimensions that we’d expect to see on a playhouse of this size, with a width of 0.59m and a height of 1.06m, but what we liked most about it was the centrally positioned round windows surrounded by wooden petals. It looks pleasing in its bare wood form, but painting can bring it to life as a colourful flower on the middle of the door. The window on the door isn’t the only feature that allows light in, as there are also two full sized windows. You’ll know of course that children and glass is an accident waiting to happen, so we were pleased to see that styrene glazing had been used. Whilst it’s still perfectly clear to look through, it’s a form of plastic and so won’t shatter or break upon any impact. Whether you’re a parent or grandparent, safety will be your main priority when selecting a playhouse. It’s ours too, which is why we were pleased to see that it had the EN71 mark to show that it meets current safety regulations. 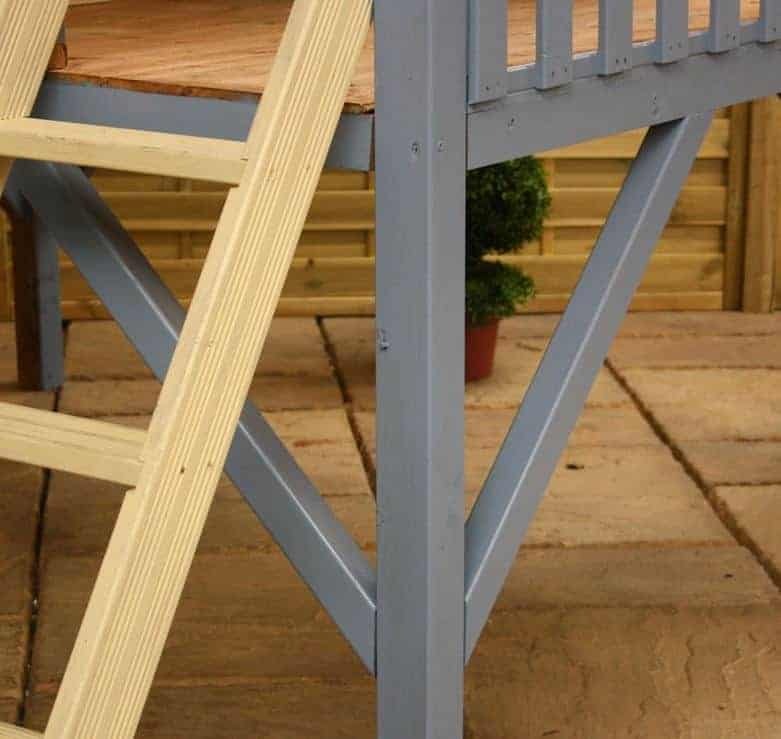 Even the ladder has been designed with safety in mind, as its firm and strong, although of course you’ll still need to supervise any children using it. 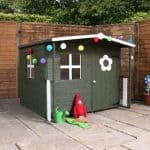 We’re sure that this playhouse will soon become full of toys and games, but a fun game can also take place outside of it if you buy the optional set of boules. It’s a simple game and yet fun for all the family, and it’s ideal for developing coordination. If you’re installing the playhouse yourself, which isn’t too difficult if you have some DIY experience, there’s a good quality toolkit available for £39.99. Alternatively, if you’re not feeling confident about self assembly, there’s the option to use a professional assembly service for the price of £219.99. One further optional extra is a set of woodstains in four natural colours. 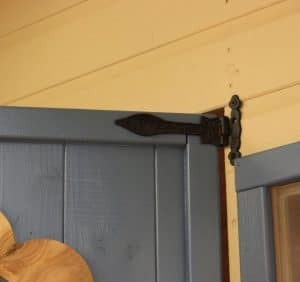 Whilst we do recommend that the wood is painted, to stop it fading with the sun, we feel it would look better in brighter shades like blues, yellows, and pinks. 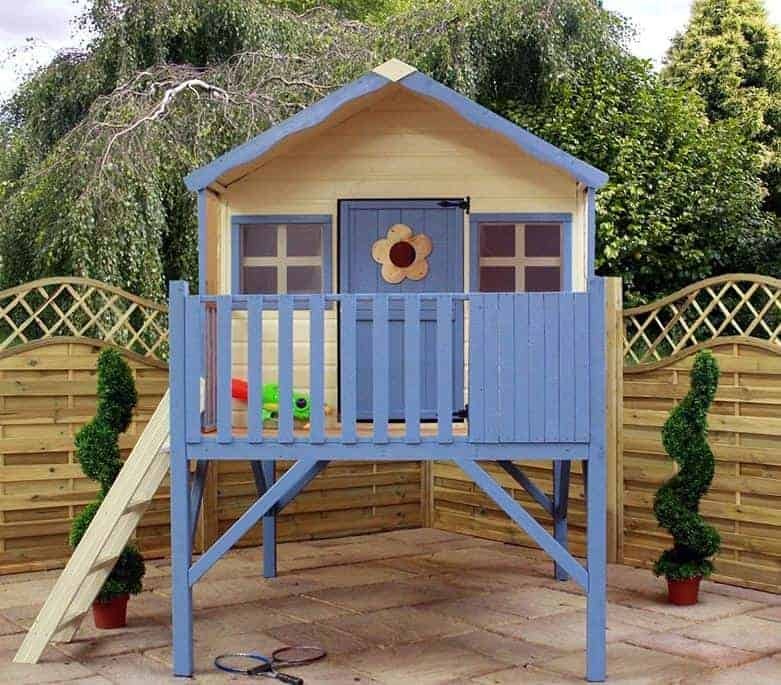 As shown by the use of tongue and groove cladding for the walls, this is a playhouse designed and built to a very high standard. We were pleased to see the provision of a 10 year anti-rot warranty, even though this is dependent upon the owner carrying out annual treatments themselves. This is towards the larger end of the playhouses we review, and there’s also room to play underneath. Thanks to its design, there are quite a lot of components, so with a friend’s help you can expect to take around five or six hours on the installation. At just a penny under four hundred pounds, we still feel this provides quite good value for money thanks to its size and versatility. 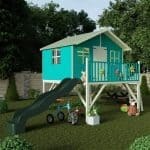 Final Thoughts: The bigger the playhouse the more fun children can have in it, so this well proportioned building is sure to be a hit with your children or grandchildren, and probably their friends as well. 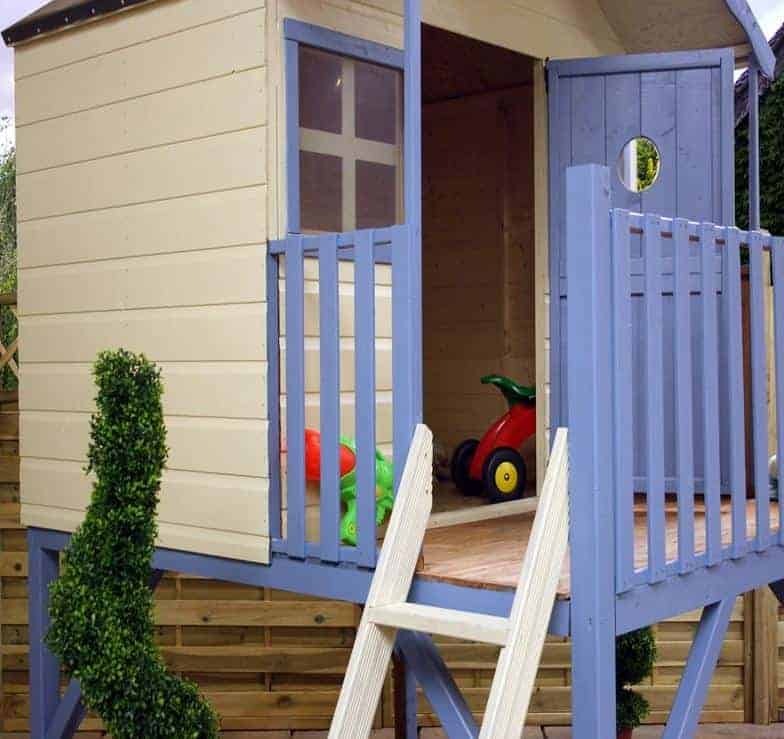 Whilst it comes unpainted, and we always recommend that bare timber is given coats of outdoor paint or stain, this provided a blank canvas allowing you to give it any colour scheme that you or your little ones like. It’s strong and reassuringly solid when assembled, and the EN71 safety mark and the use of shatter proof styrene for the windows will both add reassurance too.